The Sensory Toolbox, developed in partnership with the Department of Child Life, serves to make our patients feel as comfortable as possible during their hospital visits. It includes items such as sunglasses, a weighted lap pad, stress balls, and pop tubes. If you would like to use a toolbox at an upcoming appointment, contact us at [email protected]. If you would like to fund the creation of these toolboxes, click here. 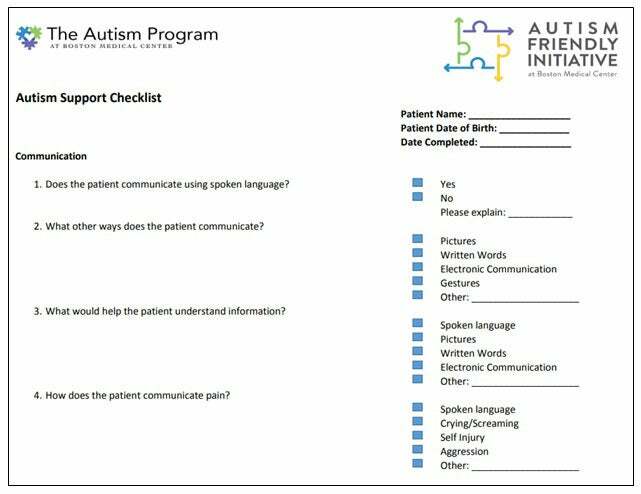 We have developed an autism specific care plan, the Autism Support Checklist (ASC), to identify the unique needs of patients with ASD so that clinicians and staff in health care settings can provide optimal support. It includes questions that address patients’ communication, sensory, and safety needs. We are completing ASCs with families and caregivers through brief phone calls for patients affiliated with The Autism Program. If you would like one to be completed for a patient, please download the ASC below and mail the completed form to The Autism Program 72 E. Concord St. Vose, Boston MA 02118 or fax it to us at 617-414-3693. This information is then entered into the patient’s electronic medical record. By giving health care providers this useful information, the ASC will improve providers’ comfort and competency in caring for patients with ASD. This will also ensure that vital input from individuals and caregivers is heard. Coming soon! This free app is a set of social stories about the various procedures that commonly take place during a healthcare encounter. The goal of the app is to better prepare patients with ASD for upcoming appointments. Social stories include how to get to a doctor’s office on BMC campus, getting a blood draw, taking vital signs, and more. You can view the website version of the app here.